EDIT: This post has sparked a good deal of heated reaction by email. I should explain that this post is not presented in the spirit of being a market call or an absolute forecast. My analysis process is to consider all the possibilities, and to stir up some debate. I do believe that through discussion and consideration of different possibilities we can improve our understanding of what is happening in the markets, and trade more profitably. Please accept the post therefore in the spirit of an interesting idea that I present for discussion. It is not a sworn statement of my conviction! This is going to be a very quick post. The town of Mogliano in Italy where I live has embraced the entirely non-Italian festival of Halloween in an entirely Italian way, with great enthusiasm. As I write this, local volunteers are setting up large pumpkins in my office windows and trying to plug things into my UPS, the better to frighten the thousands of people from nearby towns who will be coming here this evening to be scared. Last week I discussed the possibility that the October 2014 trough was of 18-month magnitude, and as the US markets all reached up to new highs today it seems most likely that it was indeed an 18-month cycle trough. While I am mostly a bit of a Hurst purist, I have occasionally suggested some unconventional ideas, and one of them is that there seems to have been a fairly regular 6-year cycle in the stock markets recently. 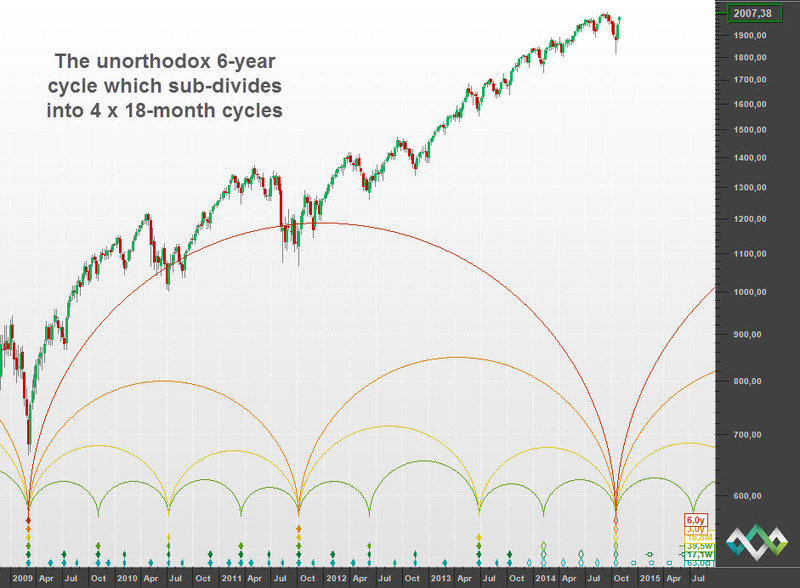 I have written about this before in various forms, and when I was writing last week’s post I toyed with the idea of showing you an update on that 6-year cycle idea, because of course the October 2014 trough completed the fourth 18-month cycle since March 2009 … which means that if there is a 6-year cycle, the October trough is also a 6-year cycle trough. Why is this a “spooky” thought? Because it means that there is lot more upside to the already impossibly long bull run that we have been enjoying. Just as I was turning long-term bearish, I’m wondering whether the bear isn’t another few years away? We might be in for a few more years of bullishness! I don’t know if you remember the chart I should you a few weeks back. This is a fib (144 pt increment) level chart and it has provided very interesting turning points for major resistance and support over the last many years. The level to watch is ES 2016. Overnight Sept. 19th ES printed 2014.5 and that was the high prior to the decline into October’s lows. We just printed 2016.5 overnight here. 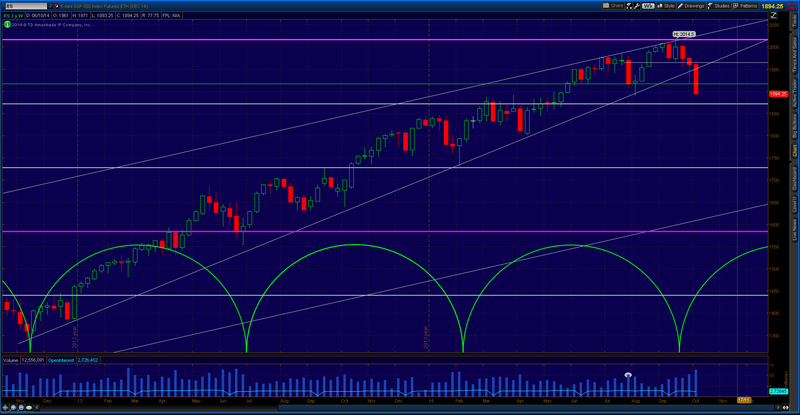 If we form a top and this level holds, I would conclude that we are finally launching into a bear market. 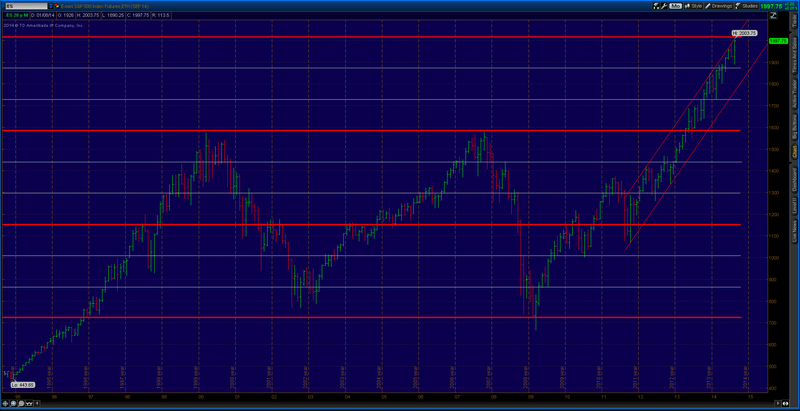 For a look back, observe how the 2000 and 2008 tops were stopped by the 1584 fib level. Hi John. I remember it well! The similarities with the late 2007 peak are striking. It is going to be very interesting to see what happens at this level. I thought I’d throw in a curved ball seeing as it is Halloween! … no worries, not spooky at all. Plenty of life left to extend the current bull-run. Let me try to trigger some spooky thoughts as well regarding your analyses. I don’t know how ST does produce these, but it looks to me that it was not done (entirely) with the Hurst econophysics “price motion model” (p44, “and now you have a price motion model!”). It looks to me that the timing is off because the proportionality principle is partially ignored by ST. This bothers me in fact already for a while. I have added a monthly graph with measurements for experimental underpinning. The top panel shows the hurst envelope, then there is the output of a comb filter and at the bottom the analysis of the dominant component, with Ehler’s autocorrelation filters. When looking over a range up to 75 bars, the autocorrelation produces a remarkably steady signal for the last three years at 42 bars or so possibly shortening at the moment, and for an autocorrelation up to 30 bars, a steady signal of about 15 months is transpiring that is also on the short side. This seems to be rather neat behaviour, and the comb filters reveal the proportionality. At the bottom I have put in narrow band bandpass filters at both values as a guide to the eye as to where the minima and maxima might be. The comb filters are set to the standard nominal model with a band with of one octave, to avoid filter ringing artifacts (this has also bothered me for a while, to see narrow band pass analyses without careful paying attention to filter ringing). The nice thing about the most recent Ehlers filters is that he corrects for the inevitable time lag in digital filtering with a digitally shifted signal line and the crossing of the signal line with the filter output (often) gives a best practice indication of the location of the minimum. Some care has to be taken with the Ehlers filters in that there is automatic gain control (ACG), which I have turned down a bit to avoid clipping of the signals, For the 18mo filter output it the output is low, in line with a short period. Your analyses have long 18 mo components, which are neither present as strong in the comb filters, nor in the autocorrelation periodograms, so I wonder where they come from and if I may have overlooked something here. Hi Huub. Your comment introduces a fascinating point of discussion. It has to do with the difference between Hurst’s “Profit Magic” book and the Hurst “Cycles Course”. The latter is in my opinion the true genius of his work. In the “Profit Magic” book Hurst introduces his ideas and explains the mathematical underpinning of his cycle work, but in the Cycles Course he addresses a fundamental issue: how to move from the results of a “mathematical” analysis to a “phasing” analysis that can be used to make trading decisions. If markets were perfect then all we would need would be the mathematical analysis. But of course they are not. And that is where analysis becomes more of an art than a science. The results of a “Mathematical Analysis” are a very useful starting point for a full Hurst “Phasing Analysis”. After reading Hurst’s “Profit Magic” book I was inspired to explore the mathematics of the cycles at work, and used many methods for extracting the cycle wavelengths that were at play. I also used Ehlers filters – he has done some great work in this field. But then I found that I had no way of applying that information. Until I studied Hurst’s Cycles Course – there is a reason that the course is over 1000 pages long. It is the “missing link” between the mathematics and the markets. Hurst himself said that phasing analysis is more of an art than a science, and what he was teaching in the Cycles Course was the “art” of phasing analysis. 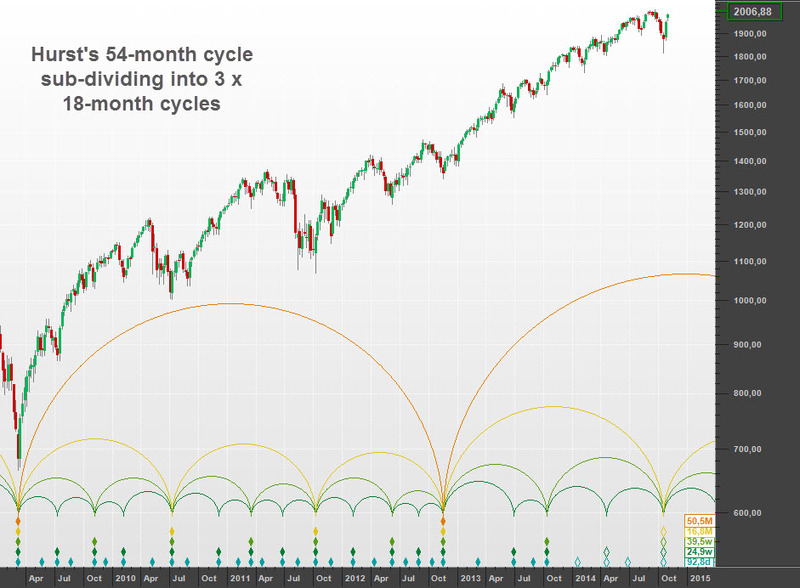 Sentient Trader will work with the nominal model that you feed it, and the point of this post is not to say that there is a 16.8-month cycle active in the market, or a 6-year cycle for that matter. The point is that if I feed Sentient Trader a nominal model that allows for those cycles, the phasing analysis that results from that is an interesting and fairly “good” analysis. I built Sentient Trader to perform the “art” of the phasing analysis, something that it does fairly well. I would love to see the analysis that Sentient Trader produces given the starting point that you have generated. You have used some powerful tools to tell us what cycle wavelengths are active at the moment. And it would be fascinating to see that starting point taken forward to produce a full phasing analysis. Have you tried that with Sentient Trader? It is easy to create a custom nominal model in ST (you would need to get the harmonic ratios right – 15 months and 42 months would need to be adjusted a little to get a simple harmonic ratio). 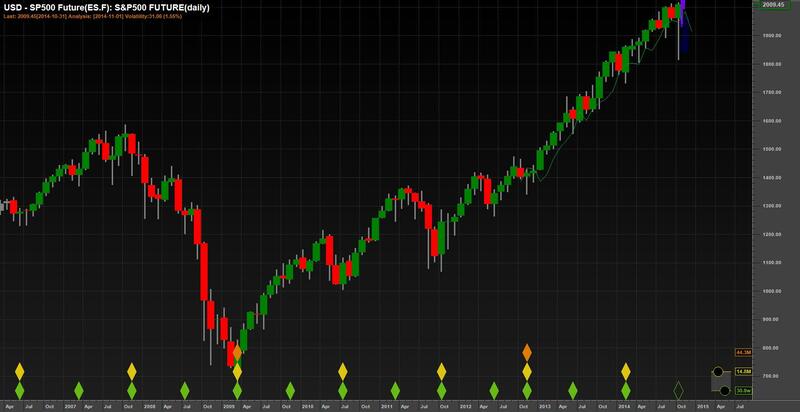 And then the resultant analysis would show how those cycles have actually played out in the markets. I would love to see that analysis. Finally I would like to reiterate that this post is an example of me playing with different analysis options and seeing what comes out of that. I think this analysis is interesting, I do not mean to declare that this analysis is definitely what is happening now. But it does offer an interesting view that has already sparked some interesting debate. Thanks for your elaborate comments. I am actually a happy subscriber to hursttradingsignals, not sentient trader. Letting the shorter cycle prevail over the longer one works better than the other way around, i.e. a 45 mo nominal model following the 15mo looks at this moment in time nicer than squeezing the three 15 mo to fit them into the 42. This follows other posts on this blog. The miracles are somewhere else. I am not an expert on this but it looks that the (mathematics) price motion model in the first book evolved into a phasing analysis in the cycles course and then became a wave theory in the latest summarizing book. A theory is something serious in the physics scientific practice, not to be taken lightly. Once you have it, you stick to it. The miracle in a theory is in its predictive range, and the grand challenge is to maximally preserve an apply this using the math, against a background of random and systematic variations. You eat an elephant in little pieces, and the first step might be to eliminate spurious results from an otherwise superb ST phasing analysis. If phasing analysis is an art, it can produce artifacts that are in apparent conflict with the theory and its predictive range, since this is what art does. For instance by adapting the nominal model on the input side, if this does not make it worse by raising some other problem. Let me add this: I see your point about difference between analysis and the real world market. If a heuristic approach works well in the market, who cares. There are three loose ends however that I find puzzling. The point above, that after the heuristic analysis a theory was proposed in cycles for traders; that the early trading experiment in profit magic had a reported 90% success rate, much higher than what is achieved now with heuristics, and that heuristics can lead to obvious anomalies when confronted with hard experimental data (i.e. the persistent loud, clear and clean 42mo signal in the 75 bar autocorrelation, and a loud, clear and clean 15mo signal in the 30 bar autocorrelation. Theories come and go, also heuristic ones, but good experimental results stay forever. Art Cashin on CNBC said that Friday, Oct 31,1014, was a world wide short covering event and that made this a very dangerous market and that such events do not last very long. I guess we will have to wait and see. 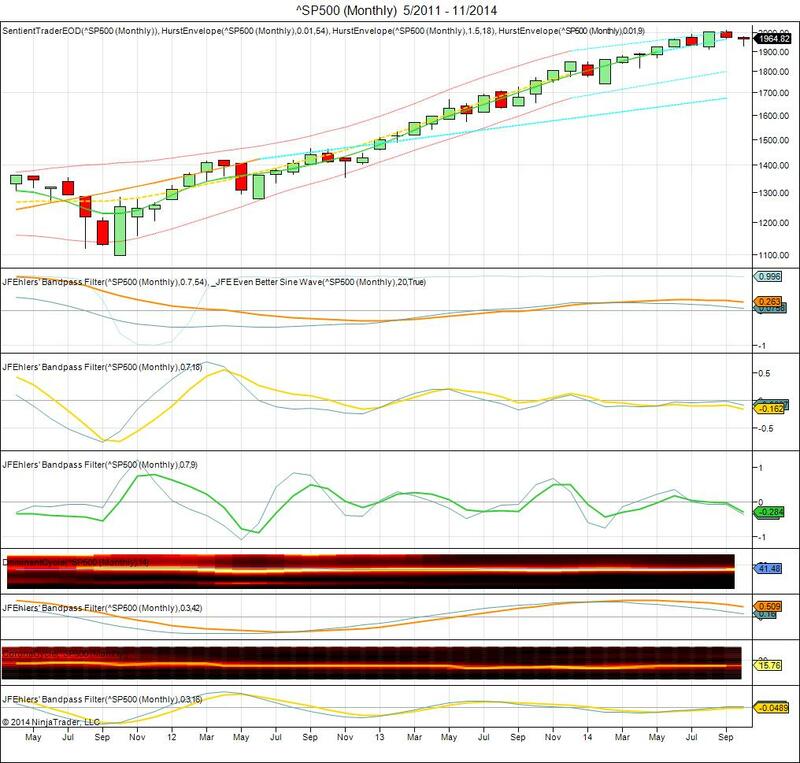 The “Market Oracle,” NW, has said this market has much further to run because of the world wide QE nonsense!